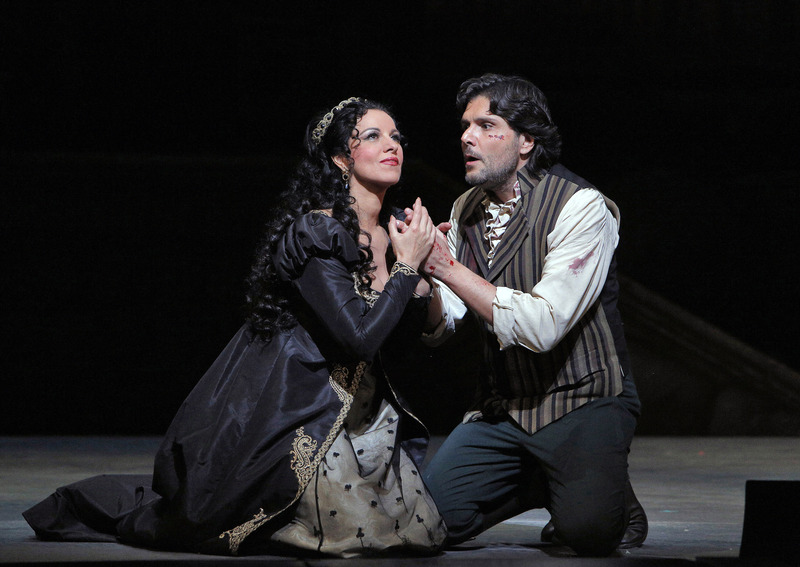 Angela Gheorghiu (Tosca) and Massimo Giordano (Cavaradossi). Photo by Cory Weaver. 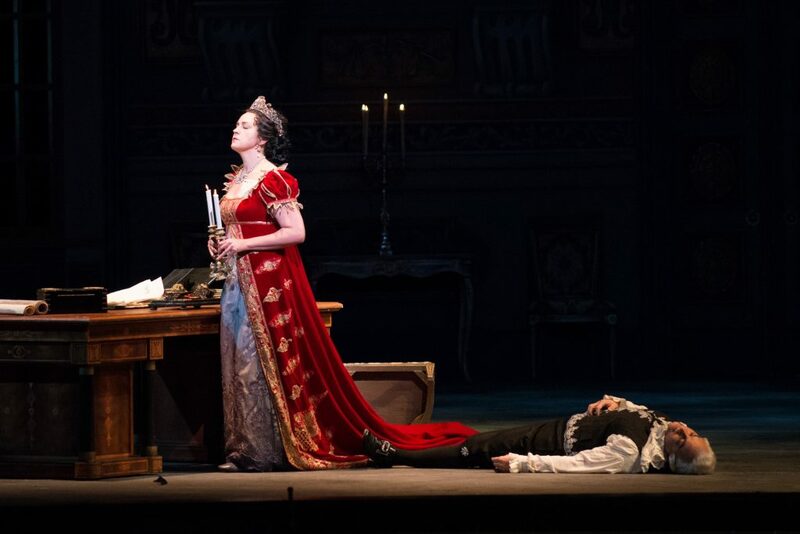 Can anything match off-stage all the drama inherent in Tosca? During the current run of the great Puccini warhorse in San Francisco Opera, the answer is yes. – Visibly stressed (understandably enough), General Director David Gockley told the audience after the intermission that the cover, Melody Moore, will take over, after she gets into costume (and, one presumed, warms up), “in about 15 minutes.” Surprisingly, it didn’t take much more than that: Moore came, sang, and conquered in this, her first performance of the role. – The Friday performance went by the book; the advertised second cast did the job, and very well at that. – At the Sunday matinee, at the time of this writing, Gheorghiu is performing as scheduled, having recovered from what was diagnosed as severe dehydration. And now, to focus on what happened on stage during all these disorders — none unprecedented in the wild, wild world of opera, but unusual and disruptive enough. The worst immediate impact on Thursday was on the over-all musical performance. Music Director Nicola Luisotti, an all-around first-class conductor with special affinity for Verdi and Puccini, didn’t hold things together the way he normally does. He merely got through the evening. This was as far from the blood-and-guts beating heart of a “Luisotti Puccini” as we are ever likely to hear: a routine, somewhat sluggish, careful, merely adequate orchestral performance, definitely not good enough for the Italian-created, Italian-affiliated San Francisco Opera. By next night, the real Luisotti and the real Opera Orchestra were back in the pit, doing great, storming lustily at the right places, but not overdoing it. 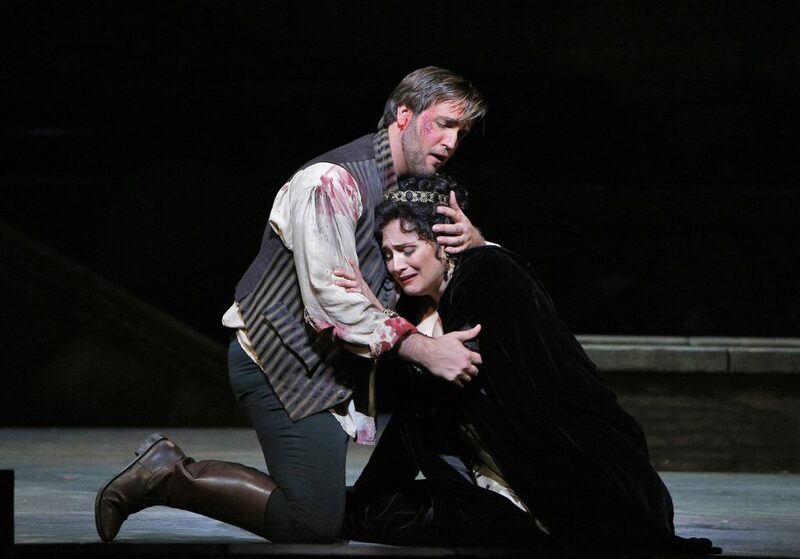 Melody Moore (Tosca) and Roberto Frontali (Scarpia). Photo by Kristen Loken. Libretto and life intertwined Thursday even before Tosca’s appearance as Scarpia sang: “The diva is missing” (from the cantata being performed offstage). The audience burst out in laughter tinged with stress. As Moore embarked on every understudy’s dream/nightmare, replacing the indisposed star, her big moment came quickly, and she sang “Vissi d’arte” (I lived for art) wonderfully well, and the long, thunderous applause reflected appreciation and relief. Beyond Moore’s stellar performance, however, the problems besetting the production also extended, somewhat, to the other singers. Roberto Frontali, acclaimed here on a previous appearance, was a just-good-enough Scarpia; and in his debut as Cavaradossi, Massimo Giordano was OK, but no not more than than. His pretty, but soft-grained voice actually improved by the third act, but “E lucevan le stelle” (When the stars were shining) received only a smattering of applause, Luisotti first getting on with the music, then halting briefly to allow the weak applause. Friday’s all-Merola/Adler stars were doing much better; San Francisco Opera’s farm team program, started 59 years ago, deserving high praise. Patricia Racette in the title role delivered all the goods expected of her, which is a great deal to say. She sang and acted impeccably, although not adding that extra something that made her Butterfly so thrilling. Mark Delavan sang a much improved Scarpia against his counterpart in the other cast. The novelty standout was Brian Jagde as Cavaradossi. Jagde’s voice is youthful and appealing. He hits high notes effortlessly, even if the sound narrows somewhat. It’s a lyrical, pretty voice, with plenty of power, and may yet take the young tenor to high places and accolades aplenty. As Jovanovich is going from Wagner to Puccini (again), so is Delavan, a notable Dutchman and Wotan, singing Scarpia, which — OK — is a fairly “heavy” role. Although the performance vocally/dramatically was good Friday, something was missing from Delavan’s voice most of the time. He has never been a singer of overwhelming power, but at his best, Delavan has a broad, embracing voice (think back to his Wotan) – and that was not all there this time. Still, orchestra and soloists together provided a first-class “Tosca” experience. And now, after today’s matinee, there will be nine more, helping the company to stay out of the red as much as possible. Brian Jagde (Cavaradossi) and Patricia Racette (Tosca). Photo by Cory Weaver.